Gonna be at the ISTE Conference? Come say hi! Next week, from June 24 to June 27, the SparkFun Department of Education will be heading to the ISTE (International Society for Technology in Education) Conference in San Diego, Cali. This is the 33rd annual ISTE conference and SparkFun is very excited to be taking part. Each year at the ISTE conference, nearly 20,000 professionals and corporate representatives from around the globe unite for four days of learning, collaborating and hands-on demonstration of the best new technologies for schools. In the past, attendees and presenters have encountered everything from robots and superboards to teachers who use World of Warcraft to present ideas to students. 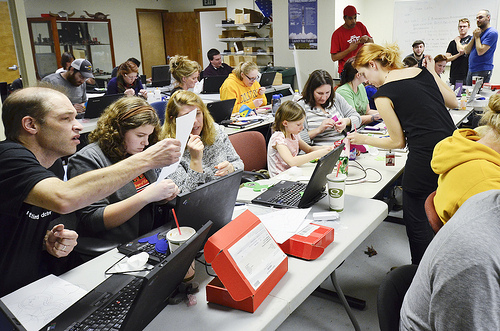 SparkFun will be bringing several kits for educators to check out! If you're going to be attending ISTE, come say hey! We'll be at booth #5448. Hope to see you there! Come see us at the Student Showcase in San Diego, Monday at 8AM!! We are 6 students who used plenty of Sparkfun prducts to build "Sparky" our robot!! See you there!! Does sparkfun rent their space or do they own it? Good to see i am not the only one in ownership of the IBM Think pad. Good luck ISTE too! Hahahaha mine runs Linux and it's still slow! We've been using Lenovo stuff here for a while. I'm not overly thrilled with their low-end laptops, but their take on the ThinkPad line seems like it's been pretty solid the last few years. Glad you will be there! Is that ISTE or ISET? ISTE. Accidentally did the ol' switch-a-roo. Thanks!